The articles below are taken from my monthly columns in St Edmund's Church parish magazine ("The King"), which includes full details of my organ voluntaries for that month. During the Easter Weekend – in between playing for services at St Edmund’s - I was listening to Classic FM’s Top 300 Hall of Fame, as voted by their listeners. There were two items for solo organ in the Top 100 and a work for organ and orchestra in the Top 30. The two solo items were Widor’s Toccata (No 66) and Bach’s Toccata and Fugue in D Minor (No 33) – both of which featured in my recent Marathon recital. The work for organ and orchestra was Saint-Saens’ Third “Organ” Symphony (No 23). As well as a composer, Camille Saint-Saens was organist of La Madeleine in Paris for over twenty years. Gabriel Faure was one of his successors there. 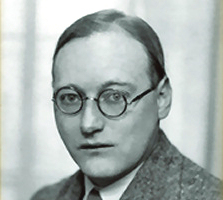 The main theme of the final movement of the Organ Symphony was later adapted and used in a 1977 pop song “If I had Words” by Scott Fitzgerald and Yvonne Keeley. Both the song and Saint-Saens’ original were also used in the 1995 film “Babe” which is about a pig who wants to be a sheep dog! I am writing this column the day after the end of the Organ Marathon. This event was a tremendous success which will hopefully raise lots of money for the Church Hall roof. The event brought the whole community together be it organising the supper, printing programmes, baking cakes, making teas and coffees or stewarding at three in the morning! I will give a personal view in the September magazine. By the time you read this, there will be less than three weeks until the Organ Marathon, which commences at noon on Tuesday July 15th. Hopefully you have already got lots of sponsors, although it is not too late if you haven’t. Spare forms are available at the back of the church. Help with security and refreshments is still needed – please get in touch if you can assist. For a minimum sum of £5, you can submit a request (with a dedication if you wish) and a preferred hourly slot. Please do so as soon as possible, either by email (organist@saintedmundschurch.org.uk), telephone (07500702220) or in person. Requests and dedications received by Sunday July 6th will be included in the souvenir brochure. The brochure itself, which will include full programme notes for the evening recital, will be available to purchase from the back of the church during the Marathon itself. I cannot guarantee to fulfill your request, especially if it is somewhat obscure, but I will do my best! Also please note that you cannot request works which I am already performing twice (such as Widor’s Toccata and Bach’s Toccata and Fugue in D Minor). During the Marathon, you can send me messages of encouragement and last-minute requests by email or text (contact details above). I shall also have a live webcam on my website (www.mark-hammond.co.uk) which will update every couple of minutes. This is the programme for the Marathon. There will generally be fifteen minute breaks at a quarter to the hour, except immediately before and after the recital where they will be more substantial. Full playlists and latest information can be found on my website. 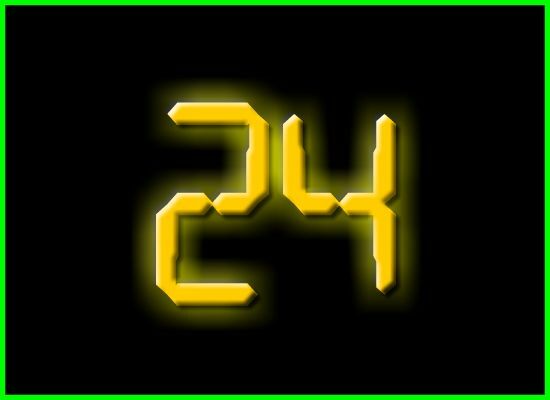 At noon on Tuesday July 15th, I shall be embarking on a 24 hour Organ Marathon in aid of the Church Hall Roofing Fund. This event was launched at the 10.00 service on Sunday May 18th and sponsorship forms are now available. Please take one and encourage all your friends, neighbours and colleagues to sponsor the event. At 7.30pm on the Tuesday evening there will be a recital featuring music by Bach (Toccata and Fugue in D Minor), Cesar Franck (Choral No.3) and Charles Widor (Symphony No 5, concluding with the famous Toccata) as well as pieces by Elgar, Barber and Gigout. This will be followed by refreshments in the Hall. Tickets to this event will be available separately. On the Tuesday afternoon I am planning to hold a children’s hour. This will include a demonstration of how the organ works and a chance to have a go as well as playing some of their requests. The remainder of the Marathon will be made up of themed segments (and brief rest periods!). Full details and playlists can be found on my website (www.mark-hammond.co.uk) and in the souvenir brochure, which will also include detailed programme notes for the evening recital and information on the organ and organist. I shall also be taking requests for specific pieces of music (on either organ or piano). These cost a minimum of £5 and must be submitted in plenty of time (organist@saintedmundschurch.org.uk) in order for me to source the sheet music where necessary. You can also state a preferred time of playing, although this cannot be guaranteed, and submit a dedication which will be included in the souvenir brochure. During the marathon, I will have a live webcam on my website which will update every couple of minutes. I will also welcome messages of encouragement by email and text as well as your presence in person. Full contact details will be available on my website and in the souvenir brochure. Help with refreshments and security will be needed for the duration of the Marathon and I hope you will be able to give a little of your time. I was interested in two recent articles which will literally change the way we look at the two great composers Bach and Mozart. The second article was about the discovery of a new portrait of Mozart (right). Until now the enduring image has been largely based on a posthumous portrait by Barbara Kraft. The new picture, probably painted by Joseph Hickel, a painter to the Imperial Court of Austria shows the great composer in 1783 aged 27. He is dressed in a red tunic and a white ruff, with a wig of grey hair and an elegant but slightly hooked nose. It has been authenticated by an eminent musical scholar. Mozart had written to one of his patrons the year before describing his desire for a "beautiful red coat" that matches the one painted. I shall be playing the second movement from “Eine Kleine Nachtmusik” - originally written for string chamber orchestra in 1787 - at the end of the month. What do I have in common with Sir Hubert Parry - composer of the hymns “Jerusalem” and “Dear Lord and Father of Mankind? We were both born in Bournemouth. Although born in Bournemouth in 1848, Parry grew up in Gloucestershire and was educated at Eton College. He went on to read Law and Modern History at Oxford University. After graduating in 1870, Parry worked as an underwriter at Lloyds whilst continuing his musical studies. He left there in 1877, confident that he could make a living as a musician. He joined the staff of the Royal College of Music in 1884 and became its Director thirteen years later, a post he held until his death in 1918. He was knighted in 1898 and succeeded Sir John Stainer as Professor of Music at Oxford University two years later. As well as the aforementioned hymns, arguably Parry's greatest work is his anthem “I Was Glad”. A setting of verses from Psalm 122, it was written for the coronation of King Edward VII in 1902 and has been performed at all subsequent coronations. Continuing the Bournemouth connection, composer Percy Whitlock (pictured above) died there. Whitlock was born in Chatham in Kent in 1903. After studying at the Royal College of Music, he moved to Bournemouth in 1930 where he was Director of Music at St Stephen's Church until 1935 and Municipal Organist at the Pavilion Theatre until his untimely death from a stroke at the age of just 42. The Pavilion organ was built by John Compton in 1929 and was designed to play both the classical and popular repertoire, including a full percussion section and a rising and falling console. Many years ago, I was fortunate to have the chance to play this historic instrument and it can still be heard weekly throughout most of the year. On Ash Wednesday, I was listening to Choral Evensong from St Alban’s on Radio 3. They performed the beautiful Allegri “Miserere. Gregorio Allegri was a seventeenth-century singer, composer and priest who lived all his life in Rome. The “Miserere” is a setting of Psalm 51 (Have mercy upon me, O God, according to thy loving-kindness: according unto the multitude of thy tender mercies blot out my transgressions) for use in the Sistene Chapel during Tenebrae in Holy Week. It was written exclusively for the Papal Choir and, reputedly, excommunication was the penalty for anyone caught copying the manuscript or performing it elsewhere. 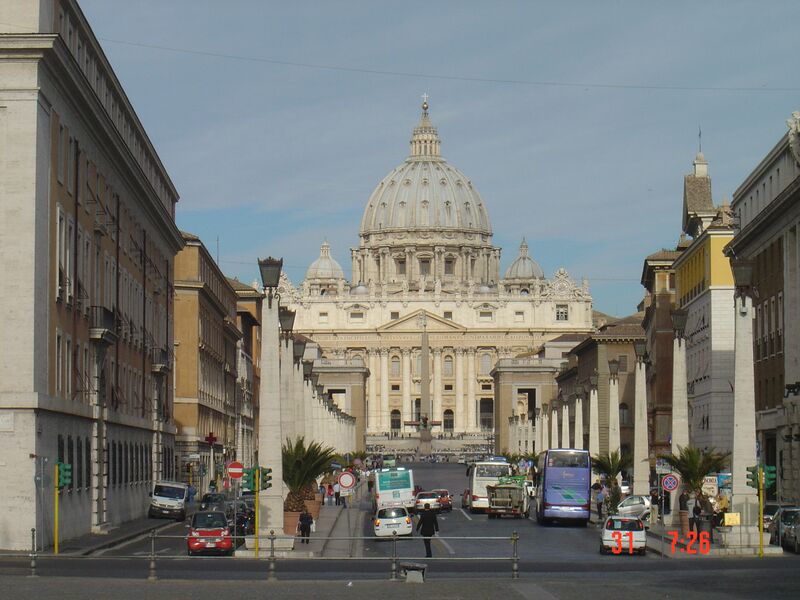 A number of transcriptions were attempted but the most successful was by the fourteen year old Mozart during a trip to the Vatican. He wrote it down entirely from memory on one hearing and returned a couple of days later to make minor corrections. Later he met the British Historian Dr Charles Burney who published the piece in London in 1771. After publication, the ban was lifted and the piece has become one of the most popular choral pieces. It has a notoriously difficult soprano line which goes up to a top C at one point. It was recorded by the treble Roy Goodman with King’s College Cambridge in 1963. Goodman has gone on to become one of Britain’s foremost conductors and is currently Principal Guest Conductor of the English Chamber Orchestra. 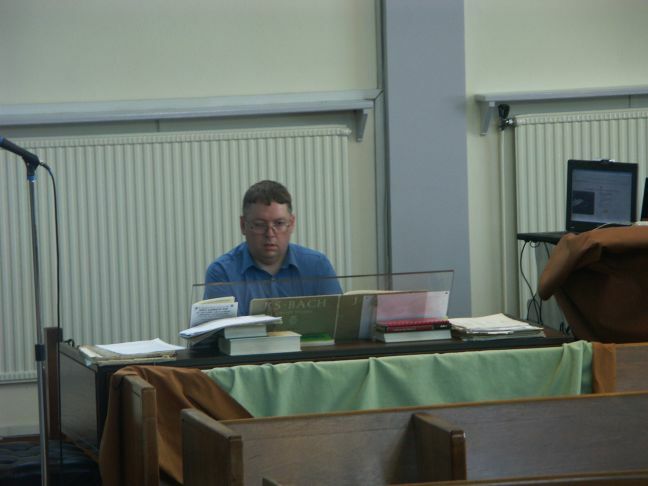 At noon on Tuesday July 15th, I shall be embarking on a 24 hour organ marathon in aid of the Church Hall Roof. Plans are currently at an early stage, but there will be a formal recital at 7.30pm on the Tuesday evening and I also hope to have a children’s hour in the afternoon. I will have more information in the coming months, including details of how to sponsor me and request specific pieces of music. A round-the-clock team of stewards and refreshment makers will also be required. If people were asked to name the composer most often heard at St Edmund’s, few would come up with John Merbecke. His Gloria and Creed are sung every week and we will be performing his full mass setting throughout Lent. Born at the start of the sixteenth century, Merbecke was by 1531 a chorister at St George’s Chapel, Windsor and was organist from 1541 until his death in 1585. In 1543 he was tried and convicted for heresy and was condemned to death at the stake. He was reprieved by Henry VIII only through the personal intervention of the Bishop of Winchester. 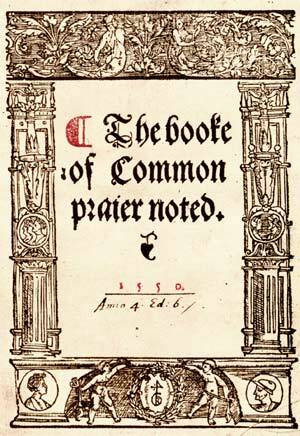 In 1550, he published his “Booke of Common Praier Noted” for use with Edward VI’s 1549 Book of Common Prayer with melodies partly adapted from Gregorian Chant. It was rendered obsolete with the 1552 prayer book revision and lay unused for three centuries until it was adapted for the 1662 liturgy and still widely used worldwide in many protestant traditions. My postludes for February and March are Bach's "Eight Short Preludes and Fugues". It is thought unlikely that Bach actually wrote these fine miniatures and they may well have been written by one of his pupils, Johann Ludwig Krebs (1713-1780). Father Bruce (pictured above at the presentation) and Barbara have chosen the music for their final service on January 6th. The Prelude is “Nimrod” from Elgar’s Enigma Variations. The work was written in 1899 and dedicated to “my friends pictured within”. The ninth variation – Nimrod – was written for Augustus Jaeger, Elgar’s best friend, and is said to depict a night-time walk the two of them had during which they described the slow movements of Beethoven's music. Nimrod is the biblical hunter and Jaeger is the German word for hunter. The Mass setting is the Short (or Dorian) Service by Adrian Batten. He was born in Salisbury in 1591 and was a chorister (and later organ scholar) at Winchester Cathedral. He later held the post of lay vicar (choirman) at both Westminster Abbey and St Paul’s Cathedral and also served as organist at the latter. His compositions consist of anthems and services (of which eight full settings survive). The main source for this Short service is John Barnard, a canon at St Paul’s Cathedral who transcribed the work around 1625. The original service consists of ten movements - there is no Benedictus or Agnus Dei and these have been subsequently reconstructed by editor Maurice Bevan from other movements of the service. The first anthem is “Ave Verum Corpus" by Wolfgang Amadeus Mozart. It was written in 1791 - the last year of Mozart’s short life. It was dedicated to his friend Anton Stoll who was choirmaster at a church in Baden, near Vienna, and it was first performed there on the feast of Corpus Christi that year. 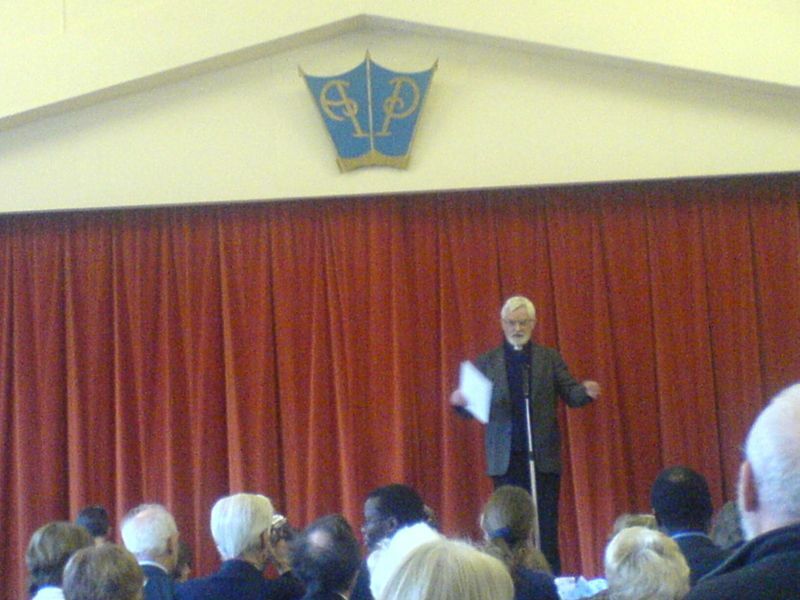 The second anthem is “A Clare Benediction” with words and music by John Rutter (Pictured above). This work was written by Rutter in the late nineties for Clare College, Cambridge, where he was both undergraduate and later Director of Music. Clare College is the second oldest (Peterhouse, my Alma Mater, is the oldest) and was named after Elizabeth de Clare, Granddaughter of Edward I, who provided an endowment in 1338 which provided for twenty fellows and ten students. Clare itself is a town and castle in Suffolk whose importance was largely due to its position on a major route from East Anglia to the Midlands. While I was studying at Cambridge, I had my organ lessons with David Sanger in the Chapel at Clare College. This is a beautiful piece, although the opening bears an uncanny resemblance to the beginning of “Oh what a Beautiful Morning”! The Postlude is the Grand March from “Aida” by Giuseppe Verdi and was first performed in Cairo in 1871. Aida, an Ethiopian princess, is captured and brought into slavery in Egypt. A military commander, Radames, struggles to choose between his love for her and his loyalty to the Pharaoh. To complicate the story further, Radames is loved by the Pharaoh's daughter Amneris, although this love is not reciprocated. I have enjoyed working with Father Bruce over the past eight years and wish him and Barbara all the best for the future. One of the things I love about Christmas is, unsurprisingly, the music. When I was a child, my parents banned me from playing carols on the piano until the beginning of November! Each year I still cannot wait to dig the Christmas CDs out. Herbert Howells was born in Gloucestershire in 1892. "A Spotless Rose", written in 1919, is the third of three Carol-Anthems. According to the composer, it was written "after idly watching some shunting trains from the window of a cottage..which overlooked the Midland Railway". The piece has a timeless, almost plainsong-like quality to it. Today Howells is probably best-known for his hymn tune "Michael" set to Robert Bridge's words "All My Hope on God is Founded". It was written in memory of his only son who died of Meningitis at the age of just nine. I originally wrote about this wonderful piece in the magazine three years ago. Peter Warlock was born Phillip Heseltine in 1894 and his pseudonym reflects his interest in the occult. Running short of money, Warlock and poet Bruce Blunt wrote "Bethlehem Down" for the Daily Telegraph's annual carol-writing competition in 1927. The carol won and they apparently used the winnings to finance an "immoral carouse". Sadly he suffered bouts of depression and killed himself in 1930 at the age of just 36. This is a recent discovery which I heard on the radio last year. Pierre Villette was born in 1926. He studied at the Paris Conservatoire and composer Pierre Boulez was among his contemporaries there. Villette was director of Conservatoires in Besancon and Aix en Provence, where he died in 1998. Villette's choral music was championed in the England by Dr Donald Hunt, then Organist at Worcester Cathedral. This unaccompanied carol "Hymne a la Vierge", written in 1955, is probably his best-known composition. Harold Darke was organist at St Michael's, Cornhill in the city of London for fifty years and achieved fame for his series of Monday lunchtime concerts where he gave over 1800 recitals. During the Second World War he deputised as organist at King's College, Cambridge while the incumbent, Boris Ord, was serving with the Royal Air Force (Howells was deputising up the road at St John's College). His beautiful setting of Christina Rosetti's poem was written when Darke was just 23. Verses for solo treble and tenor alternate with unaccompanied choir. Kenneth Leighton was born in Wakefield in 1929 and was a Chorister at the Cathedral there. He studied music at Oxford University and later returned as a Fellow and Music Lecturer. His carol "Lullay, Lulla" for soprano solo and unaccompanied choir was written in 1956 and uses the words of the Coventry Carol. It was named after the Pageant held in the Midlands town during the middle ages. This famous procession took place on the feast of Corpus Christi where ten craft guilds told the story of the world from Creation to Doomsday. This is my favourite of the sixteen or so original carols John Rutter has composed. He was educated at Highgate School. John Tavener was a fellow pupil and both he and Rutter used to compose pieces for the school carol service. One of these pieces was the "Shepherd's Pipe Carol", arguably Rutter's best-known carol and certainly the most-recorded - written at the age of just eighteen! He then went on to read music at Clare College, Cambridge and was later Director of Music there. This is a traditional French 15th Century carol, sometimes sung at Easter to the words "Now the Green Blade Riseth". This arrangement is by Stephen Jackson, director of the BBC Symphony Chorus since 1989. It was written for the Choir of the Chapels Royal at the Tower of London and was first performed in 1986. It is regularly performed at the annual Christmas Eve Service of Nine Lessons and Carols at King's College, Cambridge (pictured above). 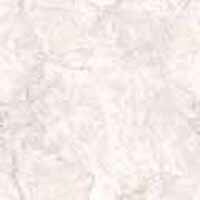 This beautiful piece is another fairly recent discovery. Aline and I heard it performed a couple of years ago in Winchester Cathedral and both instantly fell in love with it. Paul Edwards was a Chorister at St Paul's Cathedral and a Lay Clerk at Peterborough Cathedral. He is currently Organist and Choirmaster at All Saints, Kempston in his native Bedfordshire. As well has having over 400 compositions to his name, Edwards leads a busy life as teacher, singer, accompanist and examiner. John Tavener was born in Wembley in 1944 and was, like John Rutter, educated at Highgate School. He went on to study at the Royal Academy of Music, where his composition teacher was Lennox Berkeley. “The Lamb”, with words by William Blake (who also wrote the words to “Jerusalem”), dates from 1982 and was written for Tavener's three-year-old nephew and was composed from seven notes in one afternoon. His “Song for Athene” was performed at the funeral of Diana, Princess of Wales in 1997. Peter Cornelius was a German romantic composer who lived in Weimer in the circle of Franz Liszt and later became friends with Richard Wagner. His song "The Three Kings" is taken from a set of six Christmas songs and dates from the 1850s. The tune is sung by a bass soloist while the unaccompanied choir sing the Epiphany chorale "How Brightly Shines the Morning Star". May I take this opportunity to wish all of you a merry Christmas and a happy new year. If you have any comments or questions I would be very pleased to hear from you - email me. Next month I shall write about the music that Father Bruce and Barbara have chosen for their final service at St Edmund's on January 6th. 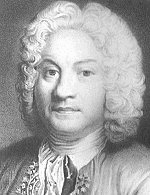 Born on November 10th 1668, Francois Couperin - Couperin le Grand - was the most renowned of the Couperin dynasty of 17th and 18th Century musicians. He succeeded both his uncle Louis and his father Charles as organist at the Church of Saint Gervais in Paris. At the age of just 25 he became one of the four organists of the Royal Chapel and a year later was appointed harpsichord teacher to the royal family. Best known for his harpsichord music (he wrote over 200 pieces for the instrument plus a hugely influential keyboard tutor), Couperin had written two organ masses by the age of 21, one for the Parishes and one for the Monasteries. The organist would have alternated with the choir singing the plainchant of the mass ordinary, a practice known as “alternatim”. The organ mass is primarily an improvisatory art, long practiced by countless organists in innumerable churches, and one still particularly strong in France to this day. Eugene Gigout was born in Nancy in 1844. He studied with Camille Saint-Saens and later taught Gabriel Faure. He held the post of organist at the Eglise St Augustin in Paris for 62 years. 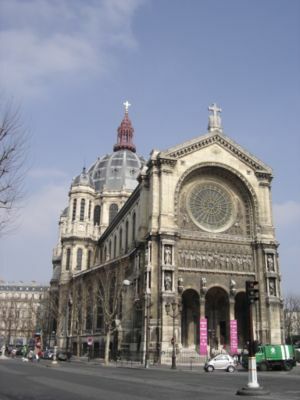 This nineteenth-century Byzantine-style church is situated near the Place de la Concorde and the organ was originally built by Englishman Charles Barker, who was famous for designing a pneumatic system which revolutionised organ-building. Gigout is now almost exclusively known for his “Toccata” in B Minor, which forms the fourth of “Ten Pieces” written in 1890. He was the uncle of the organist and composer Leon Boellmann - best known for his “Suite Gothique” - and adopted his nephew after Leon's parents died. At the age of 19, Boellmann was appointed organist at the Church of St Vincent de Paul near the Gare du Nord, a post he held until his untimely death at the age of just 35. 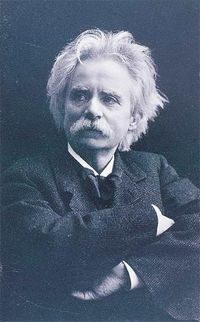 September 4th sees the 100th anniversary of the death of the Norwegian composer Edward Grieg. He was born in Bergen in 1843 and received his first piano lessons from his mother. At the age of 15 he was sent to the Leipzig Music Conservatoire where he concentrated on the piano. He achieved good grades in most areas, the exception being the organ, which was mandatory for piano students at the time! At the end of his life, Grieg recorded a number of 78rpm records which show his great virtuosity as a pianist. His best-known composition is arguably the A Minor Piano Concerto, written in 1868 and given a performance two years later by the great Hungarian composer and pianist Franz Liszt. Tchaikovsky was also a great admirer of Grieg’s music. Grieg wrote the incidental music to Ibsen’s play “Peer Gynt” which had its first performance in Christiania (now Oslo) in 1876. It amounts to ninety minutes of music which Grieg later turned into two suites, each containing four pieces, and I shall be performing three of these pieces during the month.